The No. 5 seed from the Czech Republic edges past CoCo Vandeweghe in the final of the Porsche Tennis Grand Prix. Karolina Pliskova is not yet in possession of a driver’s licence – but a dream car. 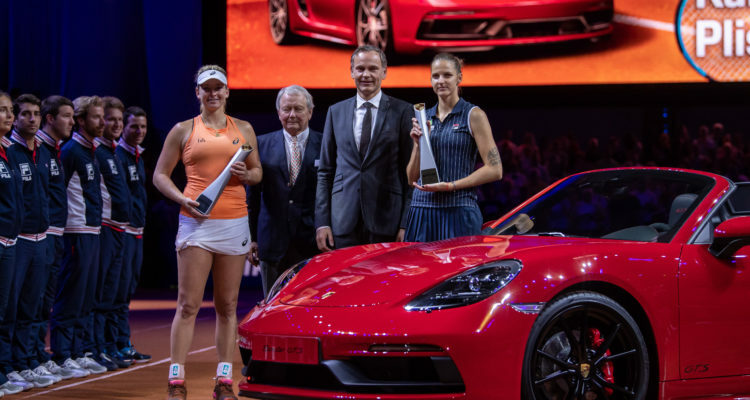 By winning the Porsche Tennis Grand Prix, the 26-year old Czech received, alongside the prize money and world ranking points, a 718 Boxster GTS as the main prize. In the high-class and thrilling final at the long-standing Stuttgart tournament on Sunday, she defeated the impressive Coco Vandeweghe 7-6 (2), 6-4 in front of capacity 4,500 crowd in the once again sold-out Porsche Arena.
.@KaPliskova wins her first WTA title of 2018 at @PorscheTennis! Even though it was not quite enough to secure the win in Stuttgart, the American nevertheless played an impressive tournament. Intensive and aggressive. Though the red clay is a surface she tries to avoid at all costs, the world No. 16 put the fear into the Top 10 stars in the Porsche Arena. 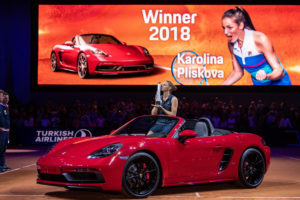 On the way to the final, she not only stopped the US Open winner Sloane Stephens in the race for the carmine red Porsche 718 Boxster, the most coveted trophy on the WTA Tour that was parked the whole week on the rostrum at the back of Centre Court. The world No. 1 Simona Halep was also unable to halt her progress and title-holder Laura Siegemund had to give up her dream of a second Stuttgart victory in succession. 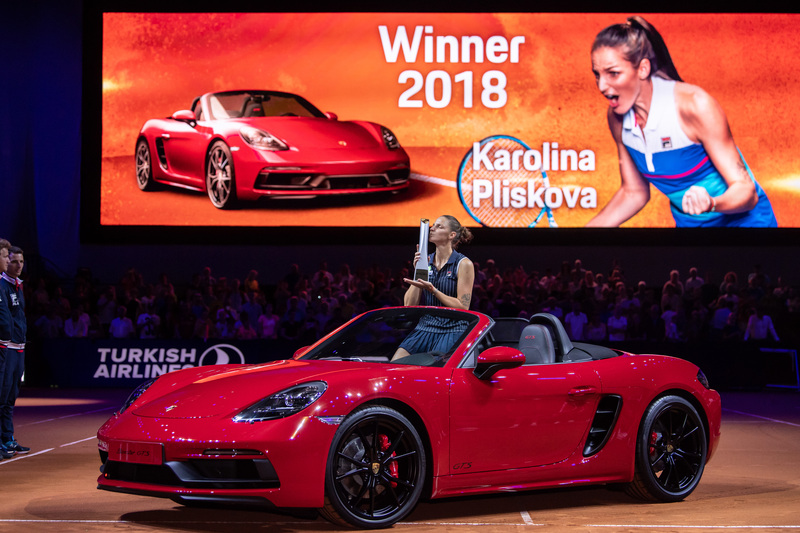 The laid-back American was given a standing ovation by the spectators in the Porsche Arena and then acknowledged Karolina Pliskova as the deserved winner of the long-standing Stuttgart tournament. She is the first Czech to claim the Porsche Tennis Grand Prix. Czech-born Martina Navratilova, the Porsche Tennis Grand Prix record-holder, was an American citizen when she bagged the first of her first six titles in 1982. Nice success for Anna-Lena Grönefeld – the Porsche Team Germany player has won the doubles in the Porsche Arena together with her American partner Raquel Atawo. In the final, they defeated Kveta Peschke of the Czech Republic and Nicole Melichar from the United States 6-4, 6-7(5), 10-5. The victors also now have a Porsche – a two-wheeler. They were both presented with a Porsche Bike RX, an attractive off-roader with a high-end carbon frame in the Porsche Motorsport look. This year the Porsche Tennis Grand Prix once again supported social projects through its Aces for Charity campaign. Porsche donated 100 euro for each of the 263 aces delivered during the course of the tournament. Porsche duly rounded up the donation to 30,000 euro. The sum was divided up equally amongst the tournament’s three charity partners, “Stiftung Agapedia”, the “Olgäle Stiftung für das kranke Kind” and the “Verein zur Förderung des Hospiz Stuttgart”. The cheques were handed over before the final by Lutz Meschke, Deputy Chairman of the Executive Board and Member of the Executive Board, Finance and IT to, amongst others, Mario Gomez the German international footballer who was in the Porsche Arena as the Agapedia ambassador. This entry was posted in WTA Premier Stuttgart and tagged CoCo Vandeweghe, Karolina Pliskova, Porsche Tennis Grand Prix, Stuttgart, WTA.